It was a bumper Friday night crowd that turned out at The Impact Arena to watch Champions take on Champions in the first pre season friendly of the summer. 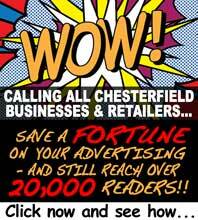 The much-anticipated return to football by fans saw Chesterfield FC triumph with a 4-1 win against Nicky Law's Alfreton Town. John Sheridan fielded nearly his whole side, with only Gregor Robertson (still recovering from injury) and Dean Morgan (illness) absent from the line up. New additions Mark Randall and Nathan Smith took to the pitch, with Smith the only player to return to the field for the second half. Three triallists were also on the team sheet for the blues. Fans also watched Aaron Downes make his return to competitive football after a long battle with injury. 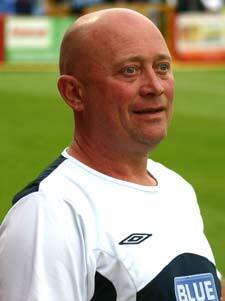 Nicky Law (pictured above) also sent out his whole squad, including the six new signings made over the summer. 'Triallist No 3' - believed to be ex Stockport player Danny Pilkington (pictured left) - hit the back of the net first for Chesterfield after 32 mins. 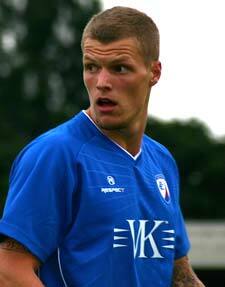 The second half saw more goal action - when Jordan Bowery doubled Chesterfield's lead on 60 mins. Matt Wilson pulled one back for the Reds though on 81 mins but Bowery got his brace by striking on 84 mins. It was now 3-1 up to the Blues. Impressive enough after the summer break? Jack Lester obviously didn't think so - getting his name on the score sheet a couple of mins later. Lowson, Law, Franklin, Hawes, Young, Franks, Moult, Mackin, Clayton, Arnold, Brown, Wilson, Streete, Hall, Jarman, Senior, Thompson, Edridge, Richardson, Turner. Traillist 1, Traillist 2, Triallist 3, Niven, Mattis, Downes, Bowery (pictured left), Gray, Clay, Darikwa, Smith, Lowry, Holden, Ford, Allott, Whitaker, Lester, Bowery, Randall, Talbot. WILL IT BE 8 FROM 8 FOR THE REDS? Law Unfazed By Only Summer Defeat. Looking Ahead. Friendly v Mansfield, 7th August 2010. Red's Hoping It's Third Time Lucky. 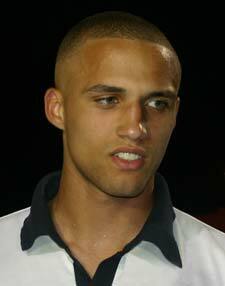 Alfreton Town Sign New Player.